Kali is one of the many forms of Shakti. Maha Kaali is the fiercest of all goddesses of Hinduism. The word Kali has its roots in the Sanskrit word "Kaal", which means time. And nothing escapes from time. Goddess Kali is sometimes referred as the goddess of death. But actually Kali brings the death of the ego. Even in the scriptures, she has killed demons but not anyone else. Kali is also not associated with Yama (the Hindu God of Death). Kali is considered a form of mother too. Maa Kali is one of the few Goddesses who are celibate and practice renunciation. Goddess Kali and Lord Shiva, both are regarded to inhabit cremation grounds. Devotees go to these places to meditate with the purpose of overcoming the ego. The cremation grounds emphasize the idea that the body is temporary. Kali and Shiva are known to stay in cremation grounds because it is our attachment to the body that gives rise to the ego. Kali and Shiva give the idea of liberation by dissolving the illusion of the ego. The corporeal frame ultimately vanishes but the soul still remains. This is emphasized by the scene in the cremation grounds. Maha Kaali is the most compassionate of all the forms of goddesses as she provides salvation or liberation to her children. 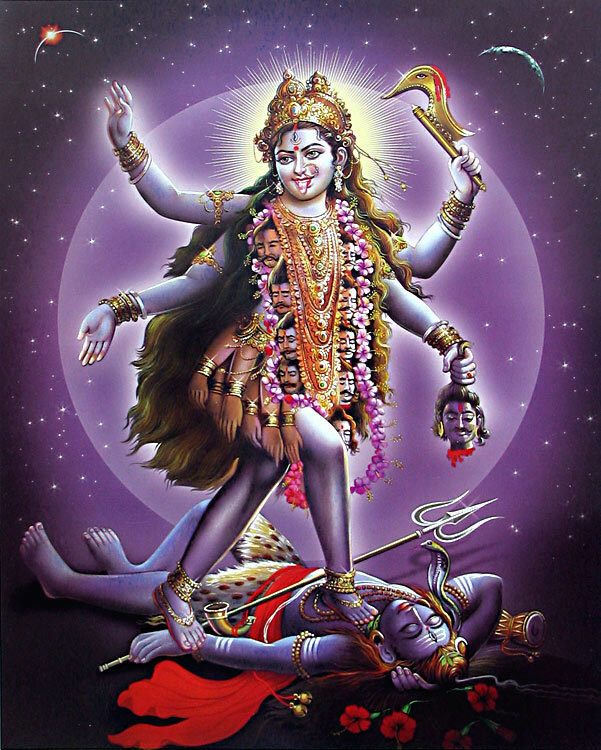 Kali is equivalent to Shiva because both of them are the destroyers of evil fake and unreal. It is considered that with the glimpse of Maa Kali, ego trembles with terror seeing its own eventual demise in her. People who are attached to their ego would not be able to receive the idea of Kali and she will appear in a wrathful form to them. But people, who are engaged in spirituality, removing the illusion of the ego, will find Maha Kaali in a different form. Maa Kali will appear as sweet, affectionate, and overflowing with perplexing love for them. Goddess Kali has four arms and hands depicting her immense strength. In two of her hands, she holds a sword and a fresh severed head, representing a great battle in which she defeated the demon Raktabija. The other two hands are there to bless her true devotees, suggesting that they will be saved as she will guide them here and in the hereafter. Kali wears a garland made of 52 skulls and a skirt made of dismembered arms because the ego comes out of identification with the body. It suggests that physical body is false and spirit is the only reality. Her black or sometimes dark blue skin represents the womb of the unmanifest from which all of creation is born and into which all of creation will ultimately return. Therefore, the concepts of color, light, dark, good or bad do not apply to her as she is the pure, un-manifested energy, the Adishakti. Goddess Kali is seen standing with her one feet on Lord Shiva who is pure formless awareness Sat-Chit-Ananda (being-consciousness-bliss) while Kali represents "form" eternally sustained by the underpinning of pure awareness.